When Jack makes a scene at a memorial party, his best friend Iris offers up her family cabin on an island in the Pacific Northwest so he can seek catharsis in solitude. Once there, however, he runs into Iris' sister Hannah who is reeling from the abrupt end of a seven-year relationship and finds solace in Tom's unexpected presence. 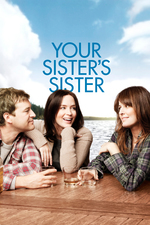 Emily Blunt, Rosemarie Dewitt and Mark Duplass in an unconventional mumblecore romantic comedy directed by Lynn Shelton. After hearing Ava DuVernay cite Lynn Shelton as filmmaker she admires, I checked out this one on Netflix. I've been watching a few "mumblecore" movies and found, like the others in this school, a little, unpretentious, enjoyable, not super ambitious movie about real-seeming people. I had some discomfort with the plot which to me exploited a weird trope of lesbians that (SPOILER) we are all secret sperm vampires. But despite this, I found the characters fairly believable and I ended up rooting for them all. The message has a humanistic, positive feel and prioritized sisterly connection in a way I grooved with. I watched Drinking Buddies recently too and couldn't help comparing the two. Ultimately, Drinking Buddies seemed like it centered the male character in a way this movie didn't, and I thought this movie was positively influenced by a feminist sensibility I liked. Emily Blunt is likable and so is Mark Duplass. It'll be interesting to see if he goes toward mainstream Hollywood now. This was an interesting little movie I was glad I watched. In my effort to edit this summary the character names ended up confusing. The male protagonist is named Jack (not Tom). Duplass and Blunt are realllly likable, as you say! Still, they could only carry about half the movie for me. The conflict and Jack's weird running away from home thing where I was like, "CUT TO BLUNT"... I do like movies with happy-ish endings, but the one here doesn't feel deserved, so the movie ended up leaving a weird taste in my mouth. I thought the standout scene was when Jack was trying to seduce Hannah. It was uncomfortable, but very well written and acted, I thought. It rang very true in terms of jerkish/charming guy hitting on a woman who is amused but under no illusions. I felt like I'd seen a lot of movies attempt that kind of scene but not come close. I had to look up Drinking Buddies. I saw it, though if I made it to the end of that one, I don't remember. It was not so good. I'm not sure what is and isn't mumblecore, but waving a hand at "Duplass movies" I feel like Baghead and Safety Not Guaranteed are my favorites of the ones I've seen.